Symmetric rolling (SR) where the roll speeds are equal and rolling-drawing (RD) where the roll speed ratio is limiting are versions of general rolling (GR). An advantage of GR is in a greater number of independent control parameters than in SR and RD (three against two and one, respectively). In this regard, GR is more flexible, thus allowing rolling schedules that ensure a fuller utilization of equipment capabilities, a reduction in the number of passes or intermediate heat treatments, a reduction in the minimum possible thickness of the strip, etc. The developed mathematical model of GR, the program for optimizing the rolling schedules against various criteria, and its numerical implementation confirm these conclusions. If compared with SR, the efficiency of GR increases with increase in the friction coefficient and the diameter of the work rolls, decrease in the elastic characteristics of the rolls, expansion of the range of mill products, increase in the strength of the strip, and decrease in its thickness. When compared with RD, the situation is opposite. An analysis of the variation in the control parameters during passages shows that as the thickness of the strip increases (decreases), the rolling schedules of GR tend to those of SR (RD). 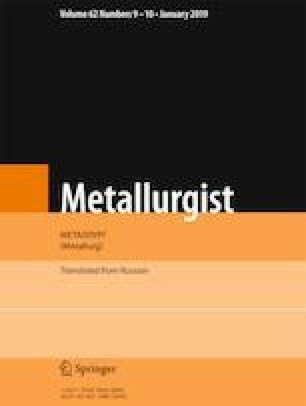 Translated from Metallurg, Vol. 62, No. 11, pp. 47–51, November, 2018.